In light of the poor performance of trying to do everything with VDI and GEM in as abstracted a manner as possible, I have decided to go in the opposite direction, rip out all of the GEM code, and start over building this on top of GODLIB. The first step, getting everything to compile properly under Pure C, took about three hours of careful massaging, but it's...compiled... and a binary spits out... and along with the ability to compile the godlib test harnesses, lets me know my build environment is sane. and I will be working in this branch for some time. WARNING: major surgery happening in here, with a chainsaw. Okay, so now, it's off to implement the specific functions I need calling godlib for screen output etc... The one positive here, is that with this, it will be more in line with my other ports, in terms of code consistency and design. Yay. More to come, very shortly. p.s. will probably move to building with purebot, once I know this approach will prove sane. Glad you found a way to do this. As mentioned in the other thread - just do a TOS/games-like-method for your program screen display. The problem I'm having, is that GODLIB is almost completely undocumented, so am flailing around digging through the code, figuring out how the different function calls work. The examples provided are ridiculously minimal. Are you keeping it compiling also with GCC? That has much better error checking than Pure-C which is sometimes very useful. Let me repeat my question that I posted some time ago as reply to your Facebook comment and that remained unanswered. I understand that you have problems getting your terminal program running at more than 2400 bit/s. I assume this means that you see data bytes being lost. I further assume this is because you simply don't use hardware flow control and the Rx buffer overflows during some operations (VDI or otherwise) that take too long. Now to my question again: Did you increase the size of the Rx buffers (in TOS or HSMODEM, depending on what you're using)? This usually avoids overruns. BTDT. Eero Tamminen wrote: Are you keeping it compiling also with GCC? That has much better error checking than Pure-C which is sometimes very useful. 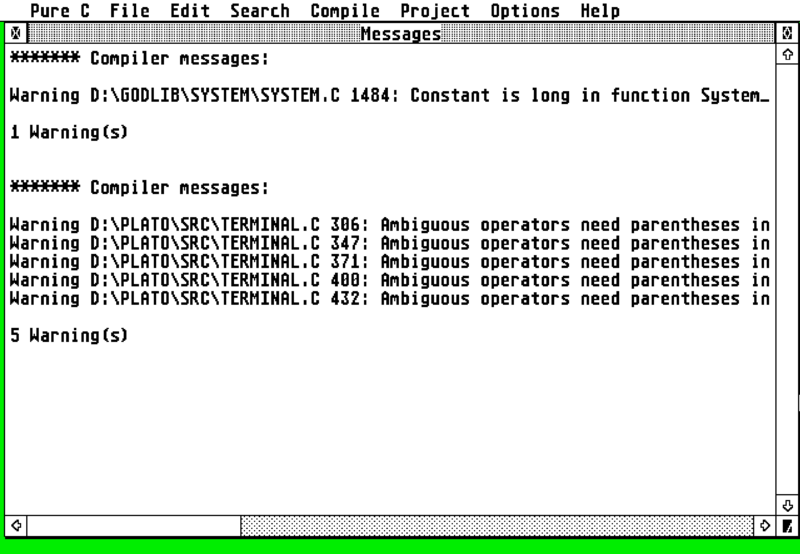 But Pure C is the only C-compiler with a decent debugger. Being able to step through source-code with the generated assembler showing at the same time beats every other debugger on this platform. joska wrote: But Pure C is the only C-compiler with a decent debugger. Being able to step through source-code with the generated assembler showing at the same time beats every other debugger on this platform. IMHO GCC telling e.g. about potential array overwrites (on highest optimization levels) and where they happen, beats searching for those problems at run-time, regardless of how good the debugger is. Note: I'm not saying it's better, just that (especially newer) GCC versions can do some useful analysis of the source code. Eero Tamminen wrote: IMHO GCC telling e.g. about potential array overwrites (on highest optimization levels) and where they happen, beats searching for those problems at run-time, regardless of how good the debugger is. Not slapping it but it's nothing new.... Pascal had it the first time I was taught about structured programming in school... but hey that is a very good feature.